No Fenders -Formula 1, IndyCar and A Whole lot more..: ROLEX 24: Who'll claim Thar Watch for Winning the 2019 GT Daytona Class? 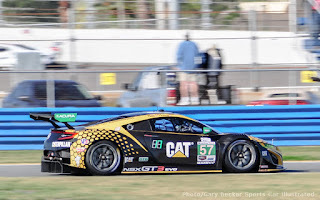 ROLEX 24: Who'll claim Thar Watch for Winning the 2019 GT Daytona Class? Ah, it's time to G-O Racing once again, with thou traditional Winter Kickoff at Day-Toner', albeit taking place upon the 3.56 mile "Road Course." Due to the GTD (Daytona) class being the largest entity in the field, Hence with a reported 23-entries Pre-Roar Before', as think that's what I read? I'll not attempt covering every single Bloody entry (A la last year) in detail) especially since they'll presumably be somewhat fluid up to Race Day. (2) Acura, (4) Audi, (1) BMW, (3) Ferrari, (5) Lamborghini, (2) Lexus, (2) Mercedes and (4) Porsche. Meyer Shank Racing, which for Mwah's still Michael Shank Racing (MSR) will return with its brace of Acura's, albeit I've missed another Memo. Since MSR announced last fall that they'd be running an All Female entry this season. As Thy Leggy Juan', nee Katherine Legge will lead the team's renumbered No. 57 with new Full-season Co-Driver Jackie Heinricher. With Tres Femme Fatales joining Legge for the Rolex 24, Nye multi GTD Class Champion Christina Nielsen and one of CARPETS' Favourite ex-IndyCar Pilotes' BIA', nee Ana Beatriz, plus ex-IndyCar Driver "Symona-Symona," aka Simona de Silvestro rounding out this Heady Quartet of le Femmes sharing Seat-time, as Heinricher will sit-out Daytona due to a Back injury. whilst the team's familiar #86 will feature such luminaries as the Dinger', aka A.J. Allmendinger alongside Mario Farnbacher, Justin Marks and Trent Hindman. As No idea if A.J. will be doing any commentary work during the race, before moving to NBC Sports Broadcast Booth. A new entity Flying the Brazilian Flag that I know Nothin' about, called Via Italia Racing will run the "lucky" No. 13. While the #51 Spirit of Race's entry's Driver's lineup was denoted as TBA prior to The Roar Before pre-Rolex 24's Mandatory test. Former Two Times consecutive IMSA GTD Class champion Scuderia Corsa returns with its well known No. 63 sporting another revamped lineup, as Cooper MacNeil, the only holdover from last season is joined by Dominik Farnbacher, Toni Vilander and the relatively unheralded Jeff Westphal. Lamborghini, , utilizing the same 5.2-litre normally aspirated V-10 lump powering the Audi's, since after all their owned by the same company, i.e. ; Volkswagen. (VW) Stirred up quite a Hurricane in the GT Daytona Class last year. As GRT Grasser Racing with its No. 11, which won last year's Rolex 24, giving Lamborghini its first 24 Hours victory ever, returns again to defend its Class Honours with Drivers Mirko Bortolotti and Rolf Ineichen looking to claim another wristwatch. Magnus racing swaps Audi Sheet-metal in favour of the Raging Bull this year. As the #44 with Andy Lally, John Potter and Spencer Pumpelly behind the Keyboard is definitely a Contenda'. Ebimotors is a new concern from Italy, which I know very little about, although seem to recall trying to find info about them on Zed Internetz' last year, possibly for Le Mans? As they'll run the No. 46 entry. Whilst I definitely Didn't know anything about the #47 Precision Performance Motorsports team before scribblin' this rant. But after accidently learning 'bout Linus Lundqvist's North Americre' Endurance Racing debut, his prize for winning the Sunoco/Whelen challenge prize. I've learned that the Defending British F3 Champion will be driving for the outfit that previously contested comca$t's NASCAR Xfinity Series before transitioning to Sports Cars last year., after closing their RASSCAR' Operation. As believe this is Thar Rolex 24 Debut? And the Paul Miller Racing #48 which won last year's GTD Championship returns with an altered line-up. With just Bryan Sellars returning Fulltime, joined by Cory Lewis and Ryan Hardwick. Perhaps Toy-Yoter' was not impressed by Paul MEATHEADZ' Gentilozzi's Unscrupulous Antics and decided to not renew his contract over this? As the new AIM Vasser Sullivan (AVS) Squad Flies the Kuhnaidiun' Flag in deference to AIM Motorsport heading the Show. While Yeah, it's the Same Vasser Sullivan of IndyCar Fame, nee "Top Jimmy" (Vasser) and James "sully" Sullivan who are Co-partners with Dale Coyne and his Sealmeister B' (Bourdais) #18 IndyCar entry. (Townsend) T' Bell and Frankie Montecalvo who drove for Scuderia Corsa last year move to the new Lexus Squad for the entire Weathertech SportsCar Championship season. With Indy Lights racer Aaron Telitz and Jeffrey Segal in the No. 12 entry. As Telitz has signed to contest all four Endurance rounds this season, and Messer Segal is a longtime Sports Car racing veteran, who I know from his past exploits with Patrick Dempsey and Team Seattle. Whilst Jeffrey's name always makes me recall thy late Awntie' Harriet's Bellowing that Steven Seagull was a Fat Head; Hya! Union' Jack Hawksworth of past IndyCar fame leads the way in the Seester' #14 entry, with Richard Heistand Fulltime. And Austin Cindric, son of Penske Racing President Tim Cindric returns to Enduro' duty alongside Kiwi' newcomer Nick "NOT DAVID!" Cassidy. As Surely? Don't Call me Shirley! Nic's heard of that 'Ol Partridge Family Heart rob, thee late David Cassidy, Righto? A new Porsche GTD Class entry from North of thee Border called Faf Motorsport, with not One, but Two Hosers - NOT Bob & Doug McKenzie; Hya! On its Driving Rolls will see Scott Hargrove and Zach Robichon as half of the contingent behind the wheel of the #9 Porsche. Meanwhile, Patrick Long, America's only Factory Porsche Driver takes refuge this year aboard the long running #73 Park Place Motorsports ride, with Co-Drivers Patrick Lindsey and Nick Boull. had its Drivers listed as TBA. Although I'm guessing that Madison Snow will return there. Once again, Audi returns with a brace of its R8 LMS chassis, propelled by the same 5.2-litre normally aspirated V-10 lump powering Lamborghini. Returning to IMSA competition this year, Starworks Motorsport in its traditional No. 8 takes the green flag as an Audi GTD entry Headlined by perennial Sports Car Ace "Razzle-Dazzle," aka Ryan Dalziel. The #19's now being campaigned under the MoreSpeed banner in Audi trim after running as the Seester GRT Grasser Racing Lambo' entry last season, with an 'Ol Formula 1 Flash-in-the-Pan' named Marcus Winkelhock on its Driver roster. And the #29 Montaplast by Land-Motorsport, which contested last year's Rolex 24 returns for another shot at victory. Whilst another of the many Kuhnaidiun' Flagged entries is the newly formed Audi Sport Experience WRT Speedstar No. 88, which is unknownst to Mwah. Although I do recognize driver Ian James name from his past Team Seattle exploits. Meanwhile, longtime Sports Car entrant Riley continues their latest project with Mercedes, campaigning the AMG GT3 normally aspirated 6.2-litre V-8 Audubon cruiser, once again sporting the No. 33 under the Team Riley Motorsports banner. Another Merc' entry called P1 Motorsports, which made its Daytona 24 Hours Debut last year, returns with its No. 71 entry.